Ollie Stedman is an injury doubt for this weekend. 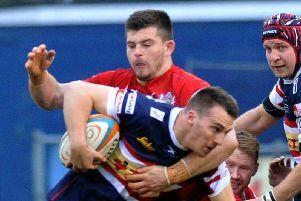 Director of rugby Clive Griffiths believes that it is almost time for Doncaster Knights to start looking forward and stop looking back over their shoulder. Successive away wins have seen Knights climb out of the bottom four and open up a 15-point lead over bottom side Hartpury, who they beat 48-21 on Saturday. “If we beat Richmond at Castle Park and Hartpury lose then we can start to focus on some of the teams above us and try and get back to what we feel is our rightful place,” said Griffiths. 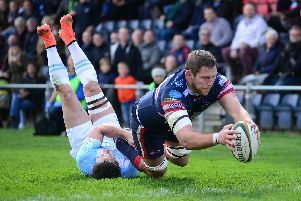 The Welshman was impressed with the way that Knights romped to a six-try victory at the Gillman’s Ground, where they lost last season, after turning around just 14-7 up. “Some of our off-loading and support play was outstanding,” said Griffiths. He added: “Credit to Paul Cooke for his pre-match analysis. Griffiths admitted that Olver’s eye-catching performance in only his second start for the club, standing in for the injured Kurt Morath, could prove to be a double-edged sword. “The worry is that if Sam keeps on playing like he is Ealing will recall him,” he said. Willie Ryan (ribs) and Ollie Stedman (ankle) both came off in the second half and could be doubtful for Saturday’s game. The loss of Stedman, in particular, would be a blow given another two-try display. “He’s done well since he returned to the club late last year,” said Griffiths.